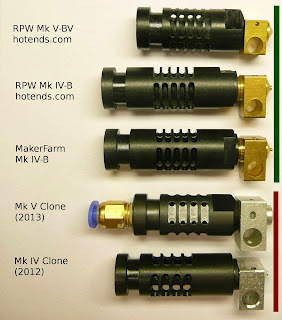 J-Head Nozzles: Comparing real J-Heads and clones. Comparing real J-Heads and clones. Pictured, above, are 5 "J-Head" hot-ends. The top two hot-ends are listed as being "RPW". These were made by myself and I have them labeled as per my company's name, Reifsnyder Precision Works or RPW. 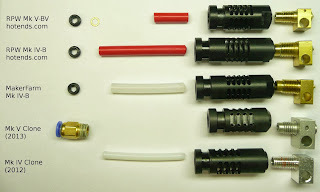 (Reifsnyder Precision Works sells hot-ends via http://www.hotends.com.) The middle hot-end was purchased from MakerFarm, Inc. The bottom two hot-ends were purchased off of E-Bay and originated in China. I have colored bars, on the right, indicating which hot-ends are made to the proper specifications and which were not. I do need to purchase a Mk V hot-end, from a company in the UK, that appears to be made to the proper specifications and review it at some point in the future. Externally, you'll notice that the top 3 hot-ends all have 5 rows of cooling vents and the Mk IV-B hot-ends are the same length. The Mk V clone has 4 cooling vents, a push-to-fit connector that could be nice for a bowden extruder, an over-sized nozzle, and the vents are not milled to the rounded contour of the core. (This will negatively affect cooling.) 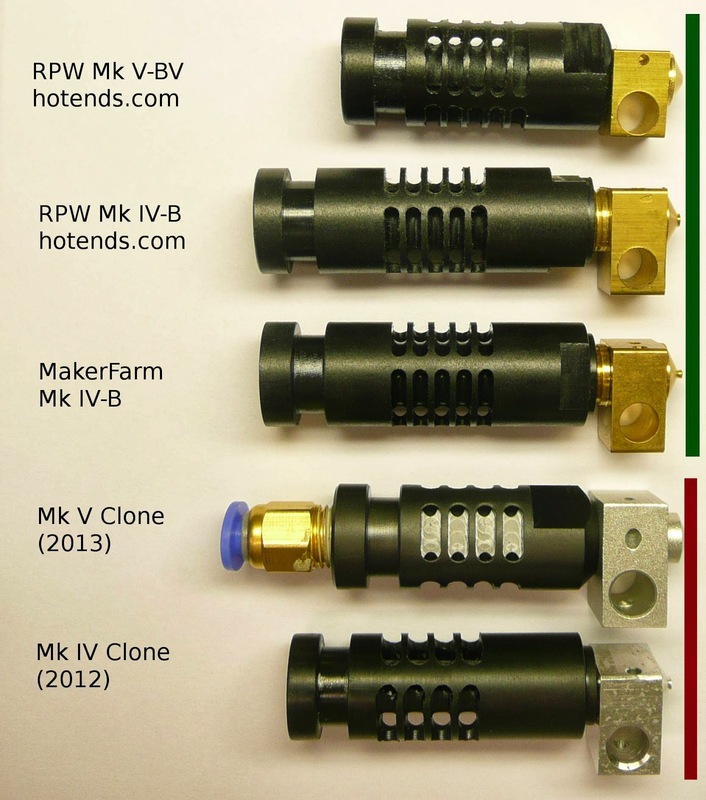 The Mk IV clone is shorter than a true Mk IV and has 4 cooling vents. After I made the first picture, I took each hot-end apart so as to display the internal differences. The first hot-end, a Mk V-BV, is made to the proper specifications. It has a hollow set-screw, bearing washer (to protect the liner from being distorted by the hollow set-screw), a PTFE liner, PEEK nozzle holder, and brass nozzle. The second hot-end, a Mk IV-B, is also made to the proper specifications. This hot-end has the hollow set-screw, PTFE liner, PEEK nozzle holder, and brass nozzle. Note that the PTFE liner is longer than that of the 3rd hot-end. This is because this Mk IV-B was made to the original Mk IV-B specifications. Note that the first two hot-ends have red PTFE liners. Since the Mk II hot-ends, I have made all hot-ends with red PTFE liners. This is not-so-obvious way to tell that you may have a hot-end that came from my shop. The third hot-end, also a Mk IV-B, is also made to the proper specifications. This hot-end has all of the same components as the previous hot-end. However, the PTFE liner is made out of white PTFE and is shorter. The later Mk IV-B hot-ends had a shorter liner so as to have a proper melt chamber. This hot-end is made to the newer Mk IV-B specifications. The fourth hot-end is completely missing the PTFE liner. It also is not bored out so as to install a PTFE liner. As a result, it will not work with PLA. I have also noted that any internal nozzle clearances cannot be compensated for that it is quite possible to have an internal gap between the nozzle and PEEK. I have serious doubts that this hot-end would work, for long, with ABS either. The final hot-end is supposed to be a Mk IV clone. There is no hollow set-scew and no way to retain the liner. This will result in a rapid failure of the hot-end. 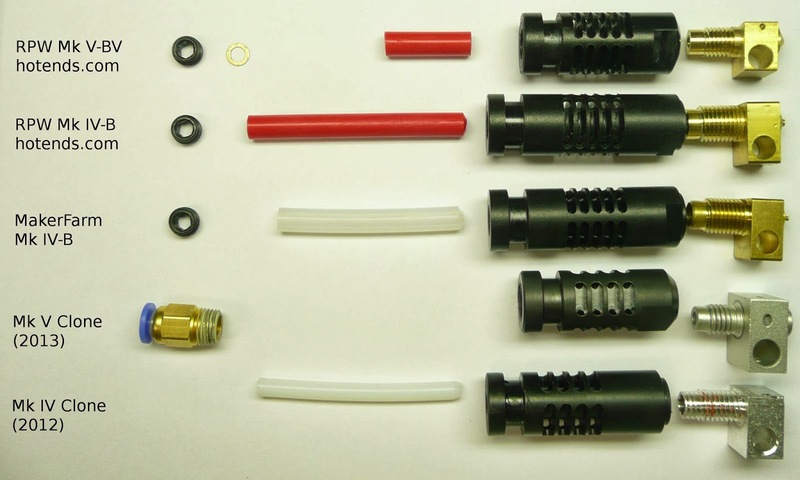 To compound problems, the nozzle is threaded all the way to the end. This will result in the nozzle not seating properly and has been proven to result in early failure of the hot-end. In addition, it is a little shorter than the Mk IV specifications. The top 3 hot-ends are made to the proper specifications that have been proven to work successfully. The bottom 2 hot-ends differ so much from the J-Head specification that I really can't think of them as J-Heads hot-ends. It appears that the fastest way to tell the difference between a quality J-Head and a cheap clone is to count the rows of nozzle vents. If there are 4 rows, short-cuts were taken and it will be of questionable value. If there are 5 rows, the proper care may have been taken to machine the rest of the hot-end. Of course, if you buy it from me, or one of my re-sellers, I will guarantee that it is free from defects and readily replace the rare hot-end that fails due to a manufacturing defect. I have the 4th type, it can extrude for a few seconds before clogging. When removing the PEEK and turning on the heat the ABS pushes out towards the new larger opening. The bore of the PEEK is about 3.5-3.6 mm so my guess is that I get some sort of back flow. I also have the 4th type. It is junk and clogs once it becomes heat soaked with pla. Also the internal threads were cut too far in and allows the pla to leak out from chamber. I was almost ready to ditch the idea of a J head until I read this. I know better now. This is real or clone. That one is a clone. There are 4 rows of wide vents. I've been using a dirt cheap ebay one. It cost me £11 in total. It's not clogged once and has done a good 80-100 hours of printing and still seems to be ok. I've only tried it with PLA so far. I've got a Budaschnozzle to try out soon so will see how that goes. I cant fault the print quality of the cheap/fake j-head I've got though. Can you link to which one you got? Just checking -- J-heads sold on Amazon with "Reifsnyder Precision Works" as the brand are safely assumed to be yours? There is a company, BioWaves, that does re-sell hot-ends on Amazon. I do make them for BioWaves. Which both clearly use your brand. I couldn't get the first link to open. The second link said that the hot-end was sold by Easy RepRap. I don't know who Easy RepRap is. However, it could be mine as many times I know the name of the person but not the company they represent. Pretty interesting. Now that time has passed, have you had the opportunity to adapt one of your hot ends to the MakiBOX? I can put three of them to work right away and there are likely hundreds more interested because of a flaky OEM hot end. I have got the Mk V clone in my printer and it works/worked quite good with PLA, but lately I experienced (more) artifacts which sometimes lead to printing spaghetti. This is something I do not want to hassle with so I ordered an original from the reseller Plastic2print today. I hope will solve my issue. Disclaimer: I did not know I had a clone until I read this article. I just dropped by e-bay and e-bay is practically spammed with clone (counterfeit) J-Head hot-ends. Today, I put an e-bay ad up for Genuine J-Head hot-ends. I am hoping for it to be more of an educational ad than anything else. Hey, do you know if there are any genuine hot ends on Amazon? Those design changes were made without having a proper understanding of the J-Head design. A real J-Head has proper support struts milled in the PEEK in order to provide better support. A real J-Head has excellent cooling as the inner PEEK wall is very thin and serves only to retain the PTFE liner. Additionally, the built-in bowden fitting can result in the hot-end failing if the PTFE liner tension cannot be set. I have real J-Heads at http://www.hotends.com. They are more expensive; but, you do get what you pay for. If you would like a heater cartridge installation, please leave a comment when you order.